When Dolphin Airways began flying on December 15, 1981, it was instantly one of the largest commuter carriers in the Sunshine State. It initially served 14 Florida cities plus Savannah, GA and Charleston, SC. During 1983 it served more Florida cities than any other airline. This first photo, showing Dolphin Airways pilots with Embraer Bandeirante N61DA, was sent in by Bill Bagley. 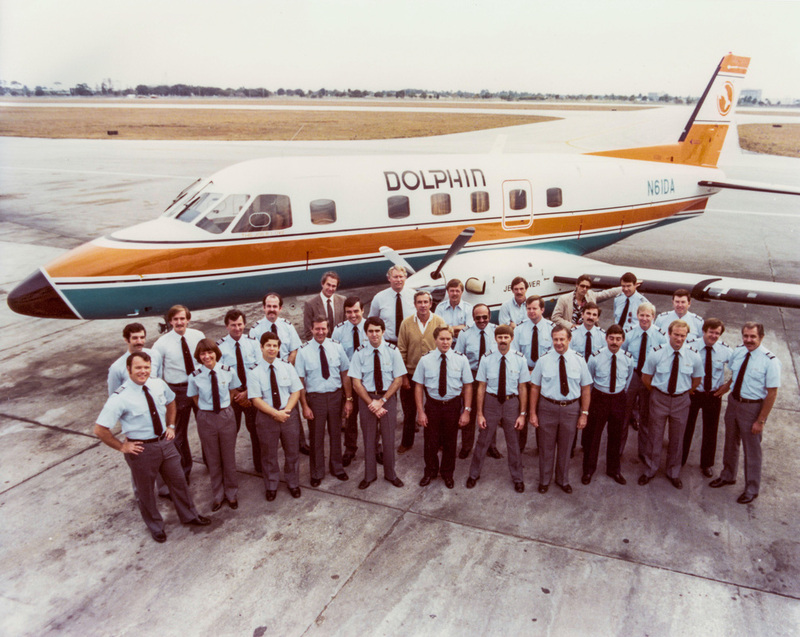 Bill wrote: "This group shot was probably taken just before Dolphin started operations in late 1981." Embraer Bandeirante EMB-110 N57DA in the classic orange and turquoise colors of Dolphin Airways. The "Bandit" was the sole aircraft type operated by Dolphin. In late 1982, Dolphin announced ambitious plans to nearly double the Bandeirante fleet, purchase five F-28 jet aircraft, hire 400 new employees and build a $4.5 million dollar office complex in Tampa. 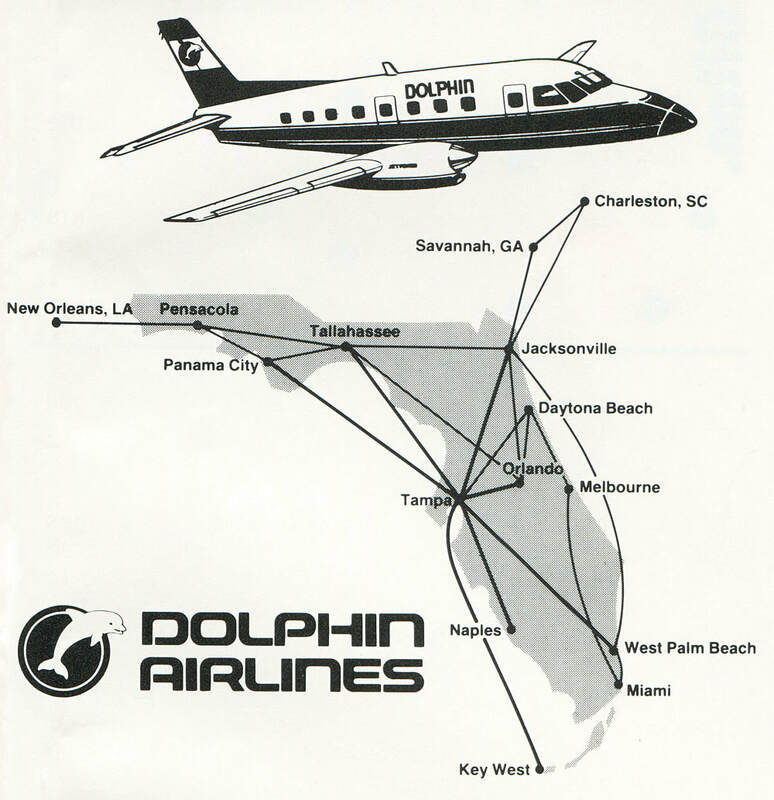 By February 1, 1983, Dolphin was serving 17 cities in 4 states: Charleston, Daytona Beach, Jacksonville, Key West, Melbourne, Miami, Naples, New Orleans, Orlando, Panama City, Pensacola, Sarasota/Bradenton, Savannah, Tampa, St. Petersburg/Clearwater, Tallahassee and West Palm Beach. Timetable scan courtesy of Arthur Na. The grand expansion plans announced in 1982 never came to fruition but the company, renamed Dolphin Airlines in early 1983, maintained a sizable route network. This map from the May 1, 1983 timetable shows Dolphin at its peak. The airline began to scale back its route structure in mid 1983. The August 1, 1983 timetable shows a dramatic reduction in service across Florida. Service to Savannah, GA and Charleston, SC had also been discontinued. Flights were briefly operated on a Pensacola - Montgomery,AL - Birmingham, AL route during August 1983 but were terminated by September 1, 1983. Timetable scan courtesy of Arthur Na. 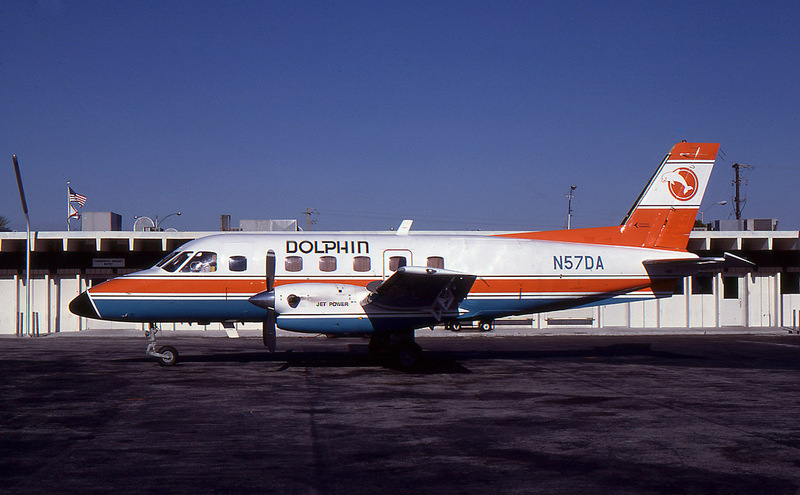 After months of service cutbacks and increasing competition from other Florida-based commuter airlines, Dolphin abruptly ceased operations on January 18, 1984 with many of its assets going to PBA. For additional timetable images and information, visit the Dolphin page Timetable Images.